Ouida (pronounced Wee-da) was the pen name of a famous romantic English novelist who took up residence at The Langham in London for four years. Marie Louise de la Ramee (1839-1908) derived her pseudonym from her infant-day attempts to pronounce her own name. 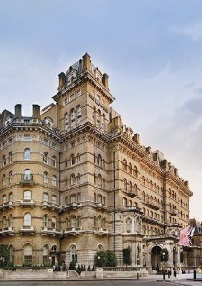 At The Langham, Ouida lived an extravagant life, receiving her notable visitors while lying in bed, surrounded by masses of purple flowers and writing manuscripts on large sheets of violet-coloured notepaper. Ouida became famous for her lavish and theatrical parties at The Langham, which were usually attended by dozens of handsome guard officers. Many of the adventures of her fictional heroes and villains were in fact based upon the people she entertained at these soirees. Two of Ouida’s most successful novels, Under Two Flags (1867) and Idalia (1867), were written soon after she moved into The Langham. Tricotrin (1869) and Puck (1870) also originated at the hotel. Named after the celebrated author and Langham guest, our loyalty initiative OUIDA recognises and rewards you for the business you book into Langham and its affiliate hotels anywhere in the world, be it in terms of room accommodation, banquet* or a combination of both. A personalised electronic membership notification will be automatically sent to you as soon as you complete the online registration form. You will then have to simply quote your membership number in future when making any reservation, to ensure accrual of your OUIDA points. To learn more about the OUIDA programme, please click here.